Vaikunta is unmatched in its beauty and splendour.It has seven enclosures or gates and a beautiful gardenfull of Kalpa trees, known as "NAISREYAM".It has numerous lakes and glittering mansions deckedwith pearls and gems.After traversing the six fortresses, the divine sages came to the gateway of Thy incomparable abode, containing the enchanting garden of Naisreyasa, various tanks and stately castles studded with gems. The sages were about to enter Thy abode to see Thee, when two gatekeepers, Jaya and Vijaya stopped them. The four sages were prevented from entering thatlast gate to Vaikunta This made the sages angry. All this happened by Thy prompting only. The sages who were thus intercepted by Jaya and Vijaya. This infuriated the sages,even though they were predominantly Satwic by nature, Cursed the door- keepers to become Asuras (demons).Their conduct was unbecoming of the denizens of Vaikunta,which is the abode of pure Satwa alone. Knowing all what had happened, The Lord of Vaikunta himselfcame to the gate, accompanied by Goddess Lakshmi seated on His Garuda bird.The sages were delighted to have a vision ofthis most attractive form. 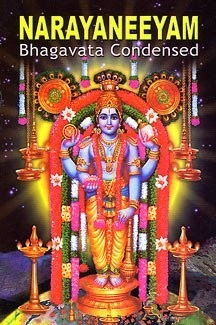 As the sages were praising Thee with pleasing words, Jaya and Vijaya, cursed by the sages, fell at their feet.They also fell at the feet of the Lord with a prayer that even in their Asura births, they should not forget the name of the Lord, which alone is the real means to be at Vaikunta. The Lord blessed the Door keepers with extreme kindness. The Lord blessed the Door keepers with extreme kindness Your demoniac existence on the earth will be for a short timelimited to three births only.Thereafter you both will come back to Vaikuntaduly purified by your death at my hands." Jaya and Vijaya were first born as Hiranyaksha and Hiranyakasipu as the sons of Kasyapa and Diti. Owing to their cruel, demonicnature these two began to terrorise this entire world of Thine. Of the two of them, Hiranyaaksha, the great Asura From his birth he was thirsting for battle.Not finding anyone equal to him in strength,he hit upon a plan to attract the attention of the Lord, So he abducted Thy beloved, Goddess Earth and drowned her in water. He then wandered around, crowingwith pride, and flaunting his mace. He heard from God Varuna,the God of Waters, that Vishnu was the only match for him.Bhoomi Devi being the dear wife of the Lord,the Asura expected that a fight with the Lord was imminent. Oh Lord Guruvayurappa ! Treasurehouse of Mercy !May Thou who art visible only to true devotees, remove my afflictions.